WinContig is an easy-to-use file defragmentation program that allows defrag of parts of the drive. This is useful for squeezing extra performance out of important or frequently used files or programs without wasting time and energy cleaning up the rest of the drive. Note that this is recommended only on magnetic disks. Flash-based drives (SSDs and thumb drives) don't benefit from defragmentation and such maintenance tools can reduce the life of the drive. 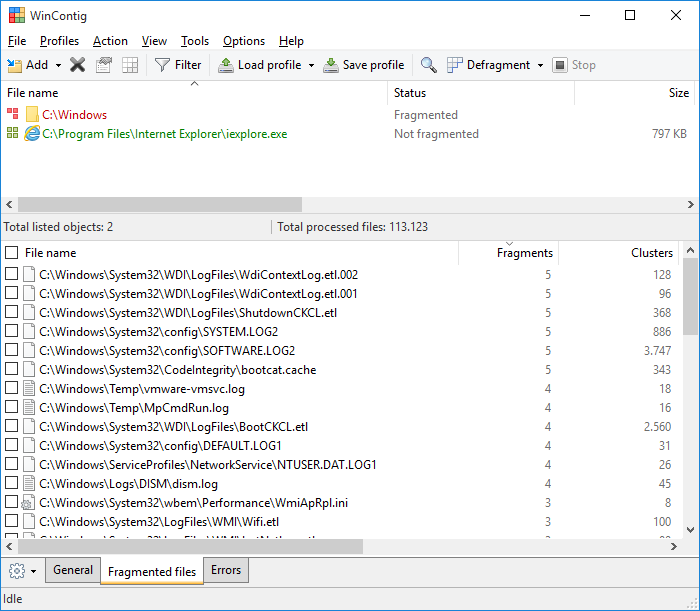 The program engine is based on the standard Microsoft defragmentation API and allows you to group files into profiles, accepting a number of available command-line switches for additional control. How to extract: Download the ZIP package and extract to a folder of your choice. Launch WinContig.exe or WinContig64.exe (for 64-bit OS). Improved startup time and support for high DPI displays. Now it is possible to show a message dialog box after the defragmentation or analyze process is complete. Now it is possible to automatically switch to the Errors Tab after the defragmentation or analyze process is complete. OK, I ran a newer version on my XP SP3 system and it worked just fine. Thanks for a nice easy defrag program with some nice display information and command line features. I actually like how the pre-version 1 versions looked better (less cluttered), but at least this works and doesn't crash and is portable and simple. aw, i just ran v1 and it crashed on my XP SP3 system. So I guess they don't have all the bugs worked out yet. To bad. The recent and current version (v1) have been very good on my Windows XP SP3 system. I went back to WinContig because for some reason the recent version of Defraggler is really slower than before on my computer. I like Defraggler too, but this newer version of WinContig is extremely fast and I like the built in system check and deleting of temporary files. I like defraggler's interface better, but they are both excellent programs. The wonderful thing about freeware is we can use both! Thanks to the WinContig creator(s) for making another excellent fuss-free program. The exclusion list is also really handy. Is ok, But prefer JKDegrag. Why isn't JKDefrag in this list? It is extremely portable, and very effective. I recommend JKD over this. An excellent program. Provided you go to the homepage like everyone should, you will understand how this works and I have to say, this is some fine freeware. It does exactly what it says and at a competitive speed. Very impressive. Now a part of my toolkit. just select it from Options menu -> Language. It seems a good idea, but got a bad error in my XP. Recommend it for programs you need to run their fastest. And went to "Profiles" - "Save Profiles As" to store those directories. Then I just load that profile whenever I need to use DrgNatSpk.